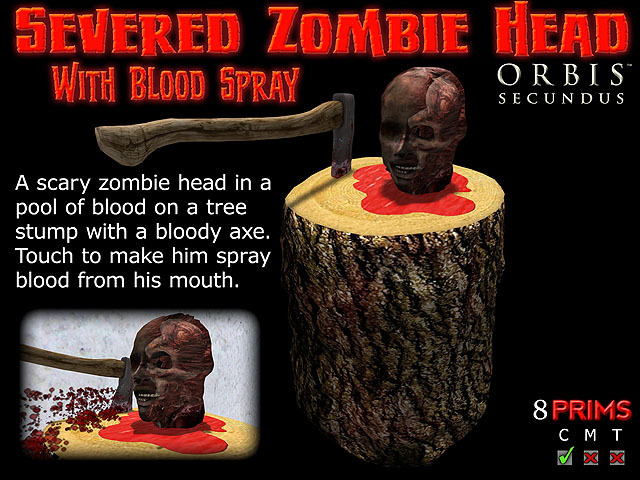 A creepy and disturbing sculpted severed zombie head in a pool of blood on a tree stump with an embedded bloody axe. Highly detailed and sprays blood from its mouth when touched. Ideal for Halloween decorating and a perfect warning for zombies. Copyable, 8 prims. Requires particles to be enabled in viewer preferences. Click here to purchase at Marketplace.